Our mouths are wonderfully equipped to perform various functions that we don’t even think about, and each tooth plays a specific role. The canines are the strong and stable teeth located on each side of the first four front teeth (the incisors). Canines’ pointed shape makes some people think of “vampire teeth,” but they really are used for holding or grasping food. At times, because of the way teeth grow in the mouth and other various reasons, canine teeth develop in the wrong position. For example, the maxillary canine tooth is the second most common tooth to become impacted, meaning it becomes “stuck” and does not erupt properly. Since canines play such a specific and useful role in the mouth, your dentist or orthodontist will most likely want to correct their position if possible. Indeed, if the canines are missing, other teeth often move out of position rather rapidly. The canine continues to grow behind your other teeth; in doing so, it interferes with their roots. The impacted tooth may become more visible and appear irregular or abnormal. A cyst forms around the crown of a buried tooth, pushing the other teeth out of position. When canines are not well positioned, the overall function of the mouth and teeth is affected. This may cause other teeth to wear prematurely. After proper diagnosis, there are several options for treatment. Complete removal: If the impacted tooth is out of position for orthodontic realignment, your dentist may recommend minor surgery to remove it. The remaining gap may be filled with an implant or bridge. Orthodontic treatment: It may be possible to move the tooth into correct alignment, using an orthodontic device such as braces (typically worn for a period of up to two years). In order to expose the tooth, a small operation may be necessary. In this case, some gum and bone is removed in order to expose the crown of the tooth. Additionally, another tooth may need to be extracted to make room for the canine. Transplantation: In this procedure, oral surgery removes the deciduous or “baby” tooth if still present, then removes the adult canine and carefully replaces it in the desired position. 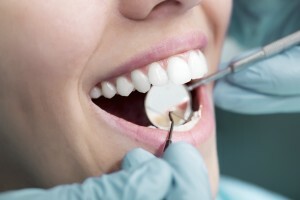 At the Yuba City Dentistry Group, your dentist will work together with you to properly diagnose any impacted canines, analyze your specific situation, and develop a plan for treatment that will produce the best results.